Confession time: November will end tomorrow and I have only reached page 122 of my 200 page revision. My revision process came to a screeching halt Thanksgiving week as I shifted into holiday prep and enjoying out-of-town relatives modes. However, although November has ended, I am determined to get that remaining 78 pages revised as quickly as possible so I can take a break to enjoy Christmas. Although I did not complete my revision, I did complete my revision reading: The Art & Craft of Writing Christian Fiction: The Complete Guide to Finding Your Story, Honing Your Skills, & Glorifying God in Your Novel by Jeff Gerke. Gerke is a fiction writer, editor, and the publisher of Marcher Lord Press. He has seen a lot of manuscripts come across his desk and is quiet familiar with the weaknesses that cause a novel not to work. While The Art & Craft of Writing Christian Fiction is targeted at the Christian novelist, the lessons on craft are lessons from which any fiction writer could benefit. Gerke proposes fiction writers adopt a new metaphor for themselves as writers and through the book shows you how to use that metaphor to strengthen your writing. The book is broken into “Masteries”, and Masteries 9-52 all deal with topics to help you develop your craft. I highly recommend this book. What book (or books) did you enjoy this November? P.S. Attention Teachers!!! Jeff Gerke has informed me there is a curriculum workbook for using The Art & Craft of Writing Christian Fiction for teaching high school Creative Writing. Check out The Art & Craft of Writing Christian Fiction Workbook, by Jeff Gerke and Mary Agius. When you are done, think about what you have read. Describe a setting from your reading. Remember, the setting includes not just where a scene or story takes place, but when—in a big sense the time period, in a more intimate sense the time of day it takes place, and the mood of the setting. Write down or discuss your responses. It’s fun to get peek into each other’s reading. I am so excited to share my second art prompt. The images here are were created by Lisa Telling Kattenbraker whose enthusiasm for developing the literacy of young readers and writers has led her to work not just with me, but others who want to get young people interested in reading and writing. Choose a person/creature from one of the images to write about. Why is he headed there? Has she experienced any opposition to her reaching her destination? How does he feel about what he is doing? What does she hope will be the outcome of her actions? Now write the scene for the character from the picture in first person point of view, using the character’s own voice. Please share your stories with each other. Enjoy the novelty and creativity of each perspective. Point out the strengths of each person’s writing. Share your responses as a comment. I’d so love to read the stories you’ve created for these pictures. This month’s Play with Your Words! Art comes to you courtesy of Lisa Telling Kattenbraker. 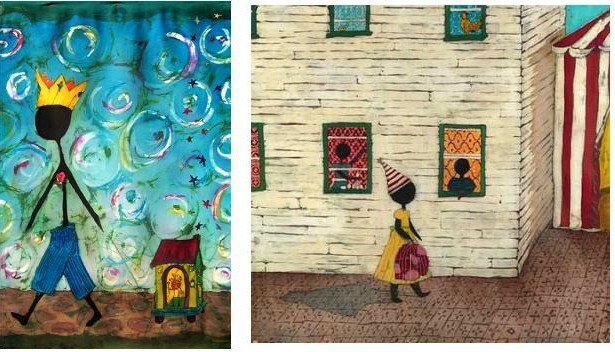 Check out more of Lisa’s wonderful contemporary american batiks at www.lisauntitled.com. New jobs this year for my husband, my son, and my son-in-law. God’s provision for my family. I’m still in my house after twenty-one years. There are books on our shelves, food in our pantry, and clothes in our closets and functional computers so I can keep writing. God’s love and forgiveness that gives me a fresh start each day. What three things are you thankful for? May God bless you and yours this thanksgiving! As a pre-write exercise, instruct your students to go through the paragraphs and make a list of all the things they wrote about. Next, tell them to evaluate this list. Are there some items that could fall under one broader category heading, Is there anything that stands out as the one, two, or three things they are most grateful for in their lives. Help them plan a basic 5 paragraph essay. Paragraph 1: Introduction. Criteria: a reflection on gratitude and brief mention of three things to be discussed in the essay. Paragraph 2: The first thing the student would like to discuss. Note your students may start with what they are most grateful for of the three, or least grateful for and work their way to most grateful in paragraph 4. Criteria: the student should name the thing he or she is grateful for and tell about it and its significance in his or her life. Paragraph 3: The second item the student would like to discuss. Criteria is the same as in paragraph 2. Paragraph 4: The second item the student would like to discuss. Criteria is the same as in paragraph 2. Paragraph 5: Conclusion. Quickly sum up the three things you are grateful for and share some final thoughts. Require your students to use the writing process: Pre-write (above), rough draft, revise, peer evaluation, edit, create a final copy. Revision and Editing (require the students to turn in the rough draft with marked revisions) 2pts. What was the hardest part of this assignment? 1pt. What was the easiest part of this assignment? 1pt. What have you learned while working on this assignment? 1pt. Have fun with the writing and have fun with the reading! It’s nice to be able to give thought to what is positive in life. And looking at what your students are grateful for will help you get to know them better. Select one character from your reading. What are three things this character would be grateful for if someone were to ask him or her at this point in your reading? Of the three things your character would be grateful for, is there one that is similar to something you are grateful for in your own life? What is it? How is the thing you are grateful for similar or different from what the character would be grateful for? Write down or discuss your responses. As a teacher, I observed that many students had no trouble thinking and talking, but struggled with writing. It wasn’t that they did not have the vocabulary or knowledge of grammar and sentence structure to write. It was simply that they found picking up pen or pencil, or sitting down at a keyboard to put the kinds of ideas they thought about or talked about on paper an intimidating task. And so, for this week’s play with your words, I present you with a quote and ask you to write down what you think about it. Let yourself write in the same way you think or talk. Allow the ideas pour out of you. When you’re done, you can go back and edit and revise what you wrote. But don’t erase the sound of your voice from it. Share what you wrote with each other. Compliment one another on the strengths in the writing. And please share your writing as a comment here on the blog. Now set yourself free and write! The clocks have changed. It’s getting dark by 5:00. Between the earlier nightfall and the cooler weather, families can find themselves home earlier, and their evening routines a bit roomier. If you do not read with your kids, now’s a great time to start. Find a cozy spot where you can snuggle together. Consider establishing some kind of ritual. My daughter loves candles—if you’re like her, maybe you can have a special scented reading candle you light only for this time. Other rituals can involve sipping at a cup of herbal tea or hot cocoa, wearing your fuzzy slippers, or cuddling under your favorite blankets. If your child is young, read to her. If your child is capable of reading himself, choose a book and take turns reading it to each other. Or read side by side. Your first objective? To simply enjoy the story and the time together. This will build a positive association in your child’s mind with reading and books, which will work to her benefit in all academic pursuits. When you’re done? Talk to each other. Talk about what you’ve read (even if you and an older child were reading different books). Discuss the characters, their dilemmas, and their decisions. Consider how they mesh with your family’s values. Share ways your reading is broadening your worlds. Have fun! Read with your child, even if he’s taller than you! Fill it in for any possible symbols you saw in your reading. Write it out and fill it in again for any additional potential symbols. Then, choose one sentence. Share your reasons for filling the blanks as you did. Explain the clues or evidence you observed in the text that led you to your conclusion.